Shortly before the start of the Sochi Olympics, Russian cinema-goers were treated to “Champions.” It was a docu-drama telling the story of a handful of great winter sports triumphs of recent years. One of the tales told was the redemption of hockey star Ilya Kovalchuk, who went from zero to hero during the 2008 World Championships in Canada, recovering from a below-par showing early on to haul the team back from the brink with a hat-trick in the final. Russia recovered from 2:4 to win the game in overtime, landing its first World crown since 1993. This is the kind of narrative that often defines Russian hockey’s self-image: the lone genius singlehandedly defending the honour of the motherland on the world sporting stage. Simple rugged teamwork is undervalued, robust skaters who stifle opponents are dismissed as a necessary evil at best … and when it come to the biggest tournaments Russia’s national team is often found wanting. 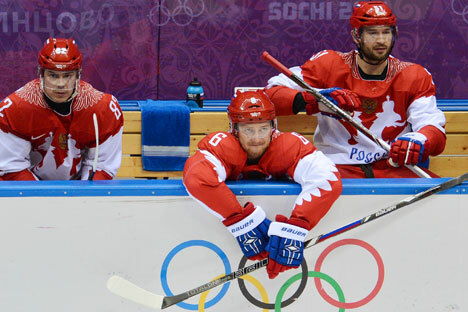 By the time the hooter sounded on team Russia’s 1:3 hockey reverse to Finland in the 2014 Olympic hockey tournament, there was no chorus of boos and jeers. A disconsolate crowd, accepting the reality of a defeat that had seemed inevitable for half an hour of game time, contented itself with a few whistles of disapproval before melting away quietly to lick its wounds. However the question of why Russia failed – and in particular why the much-vaunted firepower of this line-up produced a miserly 12 goals in five hours of regulation time hockey – is something which will, undoubtedly, be measured in minute detail across the Russian media. The inquest started swiftly. Coach Zinetula Bilyaletdinov’s post-game press conference was a prickly affair. The coach, known by the nickname Bill as a result of his time coaching in the U.S., delivered a master class in finding different ways of saying “no comment” to a packed hall of journalists, before finally losing his patience. Like most who followed the championship, Bilyaletdinov was at a loss to understand how players like Ovechkin went from terrorizing NHL defences to timidly testing goaltenders’ pads in Sochi. Ovie’s failure was the most dramatic on a team where too many big names failed to step up to the plate. Only two players managed to post a point a game – the ever reliable Datsyuk with 2+4=6 and the ever unpredictable CSKA Moscow forward Alexander Radulov, who returned 3+3. Too many others preceded their dutifully bland media observations with performances that were similarly labored. Teammate Jukki Josinen chipped in: “With Finland there are no individuals, just a team.” Finland, with fewer NHLers and missing four top-pick centers through injury, exceeded the sum of its parts where Russia added up to less than its potential. It seems that few lessons are being learned from the KHL, where the last two seasons have seen Dynamo Moscow’s decidedly un-stellar roster take the top prize thanks to well-drilled defense and an offense that wears down opponents rather than dazzling them with dekes and dangles. But the only one of Dynamo’s hard-working, selfless devotees to the cause seen in the quarterfinal was Leo Komarov, who made a typical nuisance of himself in Finland’s colors. As in Vancouver, there was some difficulty in combining players from the NHL with counterparts from the local KHL competition. The two leagues offer different styles and philosophies of hockey. Coach Bill also suffered from his trademark stubbornness. Nobody who watched his Ak Bars Kazan teams winning championships in Russia, or who followed his Russian national teams since his appointment in the summer of 2011, could claim to be surprised by what he attempted to do in Sochi. Aware that Russia’s Achilles heel has long been a dubious defense, he set up a team that would compete hard and be difficult to score on. The stats suggest it wasn’t a failure: shut-outs in two of five games after holding a powerful U.S. offense to two goals in 65 minutes represent a new, less brittle Russian rearguard. But it proved too rigid to adapt when the Finns posed problems. The only change that appeared constant – the game-by-game shuffling between goaltenders Semyon Varlamov and Bobrovski – seemed to reflect uncertainty about who was first choice, rather than decisive leadership. Russia’s apologists will point to other issues around the team. The massive weight of expectation going into this home ice Olympics ensured presidential visits, a media microscope trained on the roster and a crowd which, while big, was so sold on the prospect of watching Russia win gold that it quickly slumped into subdued mutterings when the games weren’t going according to the pre-Games script. There was little luck to be had at times, with potential game-changers like that disallowed goal against the United States and the frame of Slovakia’s goal denying the Russians an easier run to the final. And, finally, there were the ever-obdurate Finns. In post-Soviet Olympic play, Finland now boasts a 5-and-2 record over Russia and hasn’t lost in three meetings this century. None of that will deflect much attention away from Bilyaletdinov and his top players, and nor should it. But, at the same time, Russia’s roster had too much of the movie script about it. The problem for Bill – and, most likely, the successor who will be announced in the summer – is going to be finding the players who can put in the hard, attritional work that Finland excels at. It’s not immediately obvious where these players are: Russia’s depth does not run to armies of Komarovs or Lepistos, nor even world-class goalies in the Henrik Lundqvist or Tuukka Rask mold. But somehow the country’s hockey culture needs to step away from the movie screen and get back onto the ice before it can climb up to the podium once more.